Naltak was born on the home planet of his species, Anzat, where he was raised by his mother and father for the first nine years of his life. During this period he would undergo training with his father to better his skill with a blade, and also helped his mother keep the house in shape to practice being humble. Naltak’s family was one of the few that didn’t practice their species urge to “feed”, but instead found alternate means. His mother was a strong pacifist who preferred to keep things as peaceful as possible, a bit different from the normal Anzat behavior. While Naltak was out with his parents on the planet of Dantooine, they encountered what appeared to be a pack of hungry Kath Hounds, and while Naltak’s father tried to fight them off and defend his family, he had Naltak take his mother and flee, to find some form of shelter or hiding. The two ran, hoping to find a homestead or something out in the plains, but were quickly chased down by a few stray Kath Hounds, and while Naltak attempted to fight one off, another pounced towards his mother, slaying her almost instantly and leaving Naltak alone to battle the remaining hounds. During his attempt to stay alive, Naltak heard a shout from behind him, only to turn and notice two Jedi Knights running to aide him, lightsabers drawn. They didn’t strike down the Kath Hounds, but nearly used the Force to push them away and scare them off. After the coast was clear, Naltak quickly informed the two Jedi about his father, but by the time they reached him, his body was half torn to shreds from the overwhelming Kath Hounds that had attacked. This left Naltak all alone, and the one who appeared to be the oldest of the two Jedi decided to take him back to the Dantooine Enclave with them, so that he could have shelter and have the chance of survival. Naltak found himself staying at the enclave with the Jedi for a few months, where he began making friends with the other children. The first while of his stay was tough, as the known history of his species was a factor most had at the forefront of their mind when it came to Naltak, but he never showed any signs, he did everything he always could to prove he wasn’t like all the others.. that he stayed loyal to his mother and fathers beliefs in not feeding upon others. 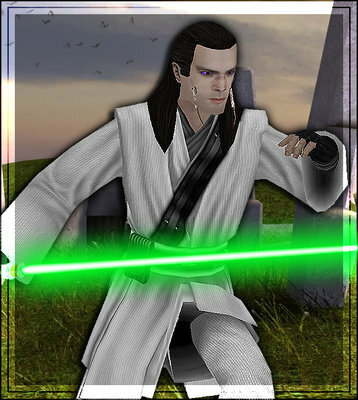 During his stay at the Enclave, the Council had requested his presence on multiple occasions, and after the fifth time they finally determined that Naltak had a strong connection with the Force, and while untapped, they felt he could become a true Jedi if trained properly, and so allowed him to undergo the trainings of the Jedi Order, and on that day Naltak found himself to be a Jedi Initiate. Over the next year Naltak would train as hard as he could to memorize all that he was given, between the Jedi Code and the history of the Jedi Order, studying the different branches of the Order, as well as training in his saber arts, wanting to stay true to what his father taught him, but also would help the clean-up droids around the halls, so that he could remain humble as his mother always taught him. After a year passed, Naltak was taken before the Jedi Council once again to undergo his Initiate Trials, where he passed every one to the best of his abilities. While he perhaps just barely passed on the Ethics of a Jedi, he made up for in his knowledge of the Code and his ability in Saber Arts.